Dexid-70 is a phosphate- and odor-free, new-generation, highly concentrated detergent sanitizer, designed for use in all classes of livestock, food industry and on food contact surfaces. Dexid-70 includes two different quaternary ammonium compounds that expand its effect to a wide range of bacteria, viruses and fungi, like Escherichia coli, Staphylococcus aureus, methicillin resistant Staphylococcus aureus (MRSA), Streptococcus haemolyticus, Streptococcus pneumoniae, Streptococcus equi var. zooepiderrmicus, Streptococcus pyrogenes, Yersinia enterocolitica, Listeria monocytogenes, Rhodococcus equi, Salmonella cholerasuis, Salmonella schottmuelleri, Salmonella typhi, Salmonella typhimurium, Enterococcus faecalis (including vancomycin- resistant ones, VRE), Acinetobacter baumannii, Brevibacterium amoniagenes, Mycoplasma gallinarum, Mycoplasma gallisepticum, Mycoplasma hyopneumoniae, Pseudomonas aeruginosa, Enterobacter aerogenes, Klebsiella pneumoniae, Serratia marcescens, Shigella dysenteriae, Vibrio cholerae, Bacillus cereus, Trichophyton mentagrophytes, Candida albicans, Hepatitis B virus, Herpes Simplex virus type 1 & 2, HIV-1, Avian Influenza, Infectious bursal disease (Gumboro), Cytomegalovirus, Newcastle Disease, Parainfluenza type 1, Pseudorabies virus, Influenza Type A and Vaccinia virus (Poxvirus). Cleaning of equipment: 1 litre Dexid-70 for 200 litres of water in a clean tank. Sanitation: 1 litre Dexid-70 for 200 litres of water in a clean tank. 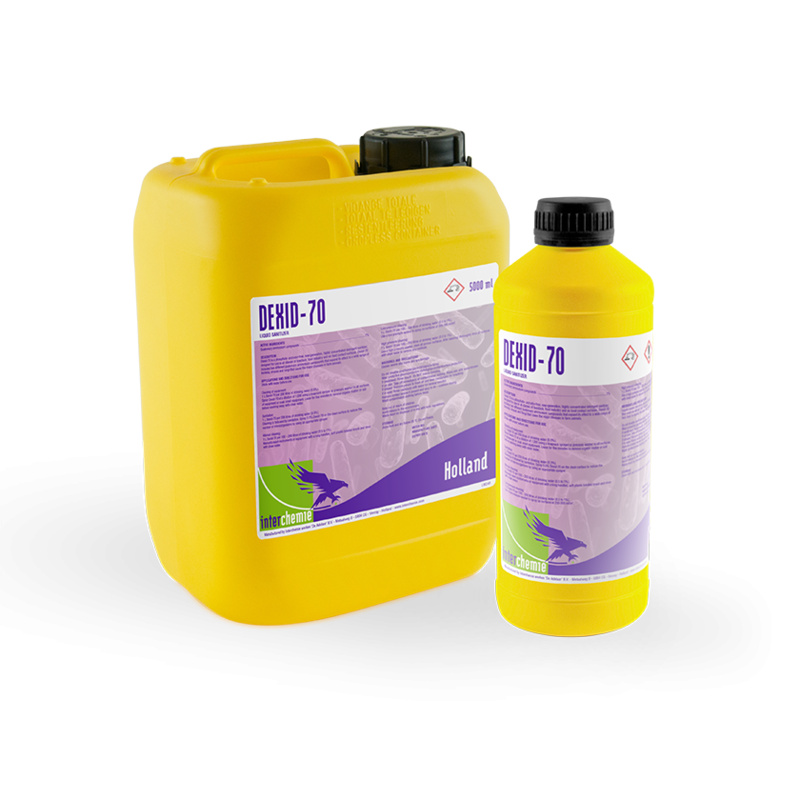 Manual cleaning: 1 litre Dexid-70 for 100 - 200 litres of water in a clean tank. Low pressure cleaning: 1 litre Dexid-70 for 100 - 200 litres of water in a clean tank. Use a volume of approximately 250-300 ml/m2 surface area. High pressure cleaning: 1 litre Dexid-70 for 100 - 200 litres of water in a clean tank. Instruments, equipment and tableware that will come into contact with food should be thoroughly rinsed with water after cleaning and disinfection. Dexid-70 works in hot and cold water and is readily biodegradable. - Harmful if swallowed. In case of emergency, wash out mouth with water and give 200 ml of warm water to drink. DO NOT induce vomiting. Seek medical advice immediately. - Do not apply Dexid-70 in the presence of animals. - Personal protective equipment such as gloves, masks and eye protection should be worn during the mixing or application of Dexid-70.